The Fertility Diet unveils scientific research, showing that the food you eat can increase your chances of getting pregnant. This book outlines simple diet and lifestyle changes you can implement to boost your fertility. It especially applies to women when ovulation is the primary cause of difficulty conceiving. This Fertility Diet is based on research from a subset of the Nurses’ Health Study involving 400 women with ovulatory infertility. This study spanned many decades and tracked the diet, exercise and lifestyle choices of the women involved. From the results of this research the authors reached conclusions about the type of diet that increases a woman’s likelihood of getting pregnant. This book highlights their recommendations and explains how healthy diet and lifestyle choices can boost fertility. The overall diet pattern associated with better fertility is similar to a Mediterranean way of eating. Use more monounsaturated fats such as extra-virgin olive oil. Eat more vegetable protein and less animal protein. Choose whole grains and other low-glycemic carbohydrates. Drink a glass of whole milk or have a small dish of ice cream or full-fat yogurt every day. Get plenty of iron from fruits, vegetables, beans and supplements but not from red meat. Avoid sugary sodas and limit your intake of coffee, tea and alcohol. Take a multivitamin that contains folic acid and other B vitamins. The advice in this Fertility Diet is specifically aimed at preventing and reversing the type of infertility that is related to lack of ovulation. It might work for other types of infertility, but currently there is not enough research to confirm this. In addition, there are many possible causes for infertility and each woman should focus on how to improve general health. Black beans, kidney beans, garbanzos, lentils, tofu, all-natural peanut butter, almonds, pumpkin seeds, sesame seeds, salmon, tuna, halibut, mackerel, herring, whole-grain bread, whole-wheat pasta, brown rice, quinoa, oats, spelt, amaranth, whole milk, cheese, ice cream, spinach, kale, broccoli, asparagus, Brussel sprouts, sweet potato, berries, citrus, extra-virgin olive oil, canola oil. Exercise is an important factor to help you achieve your ideal weight, which can improve fertility for many women. If you are overweight, losing between 5 to 10 percent of your weight can jump-start ovulation. If you are not currently physically active you are encouraged to begin with thirty minutes of brisk walking. You can build up to 60 minutes of exercise each day. Women who are underweight or very lean need to be careful to avoid excessive exercise. For this group of women fertility can be improved by gaining a little body fat. The Fertility Diet: Groundbreaking Research Reveals Natural Ways to Boost Ovulation and Improve Your Chances of Getting Pregnant retails at $16.95. Involves simple lifestyle changes that are easy to implement. Offers an approach to boosting fertility that is inexpensive and free from side effects. A fertility diet Can produce benefits on all aspects of your health, not just fertility. Includes a one-week meal plan with recipes. The recommendations may not be medically relevant for all women. Irregular ovulation – the subset of infertility that this book is targeted towards – affects less than one third of women. The study involved a small group of women and the results need to be replicated before firm advice can be issued. This fertility diet encourages the use of canola oil, which is genetically modified and contains toxic compounds. Conflicting research indicates that dairy products may have a negative effect on fertility. The Fertility Diet outlines lifestyle advice that can normalize ovulation and increase a woman’s ability to conceive. The dietary recommendations in this book are similar to that of a Mediterranean way of eating. 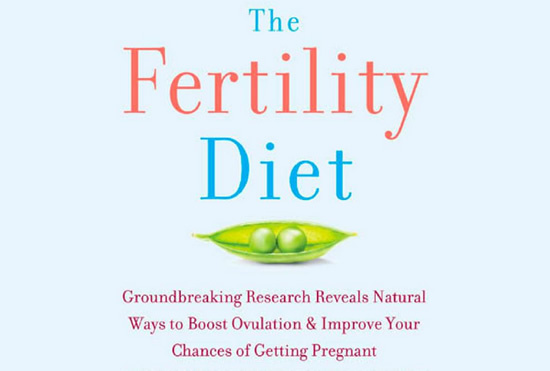 The authors don’t promise that the diet is a cure for infertility. However, making healthy lifestyle choices will improve general health and may increase a woman’s chances of becoming pregnant. Chavarro, J., Willett, W., & Skerrett, P. (2009). The Fertility Diet: Groundbreaking research reveals natural ways to boost ovulation and improve your chances of getting pregnant. McGraw Hill Professional.